Miss Universe Organization Ambassador Pia Alonzo Wurtzbach confirmed that she will be visiting Thailand on August 3 to grace an exclusive meet and greet event. Miss Universe 2015 will meet her Thai fans and media from 1 PM- 3 PM at Sava Dining Room on the 6th Floor of the Helix Quartier Building at EmQuartier Shopping Mall in Bangkok. 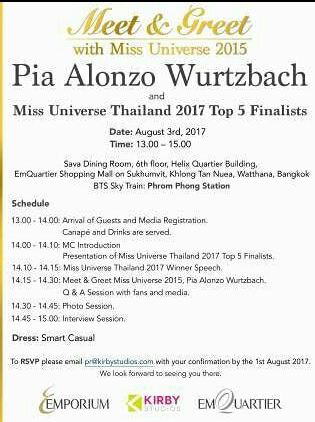 The winner of Miss Universe Thailand 2017 with her court will also join Pia for this exclusive event. To RSVP, please email pr@kirbystudios.com with your confirmation by 1st of August 2017.